The time has finally come! The Legend of Zelda: A Link Between Worlds pins are now available in the Collectible Badge Center for the Japanese 3DS, and collecting them all will unlock a free A Link Between Worlds 3DS theme. The pins can be collected through a pay-to-play crane game in app, and YouTube channel NintenDaan has released a video showcasing the Link Between Worlds’ crane gameplay. During the Nintendo Direct today, we got some interesting news about Ultimate NES Remix – the NES Remix port for the 3DS. Apparently, if you purchase either the digital or physical copy of Ultimate NES Remix, you’ll get a free Famicom-inspired 3DS theme. It even has Link and Ganon in it! You can check it out after the jump! 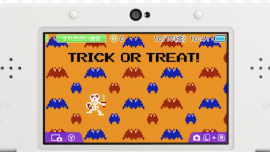 Nintendo Of Japan have revealed a new Halloween theme for the 3DS,and it is sure to send a shiver down your spine. Make the jump to check out the official trailer, featuring an awesome piano cover of the original ‘Underworld’ theme!